On Saturday, I went out to dinner with girlfriends for the first time in months. Before having Nino I couldn’t comprehend parents who never went out, always assumed it was easy but – (not such a ) news flash – it’s not. There’s a reason why all those friends with kids smile wryly and forecast the end to your social life as soon as you tell them you’re pregnant. Being a parent is wonderful in more ways than can be imagined, but it can also be repetitive, tough and – unless you have a live in nanny, endless family or an even more endless supply of cash – full time. Add into the mix a not-so good sleeper, breastfeeding on demand and separation anxiety (both Nino’s and mine), and you’re talking stay-at-home central. Now that Nino’s weaned and a little happier about being put to bed by anyone other than me, I foresee a future including a few more nights on the tiles. But much as I love the uninterrupted adult conversation, taking a taxi, going to bed after 10pm, I’m a homebody at heart. Yes I love my Michelin starred meals, but few things make me happier than curling up on the sofa with a big bowl of something baked in my lap. Bowl rather than plate because in this dream situation, said baked good would be warm and topped with the obligatory cold scoop of ice cream. 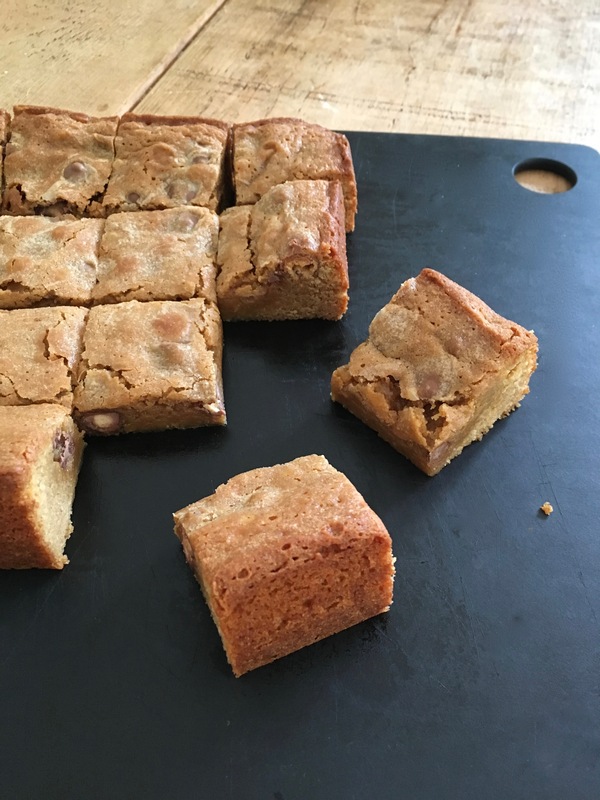 These malted milk chocolate blondies fit that bill in every way. Crisp round the edges and in each burst of Malteser, sweetly stodgy in the middle with that childhood hug in a bedtime mug flavour of malted milk, they’re the perfect food for eating in your PJs, preferably accompanied by a big scoop of chocolate ice cream. 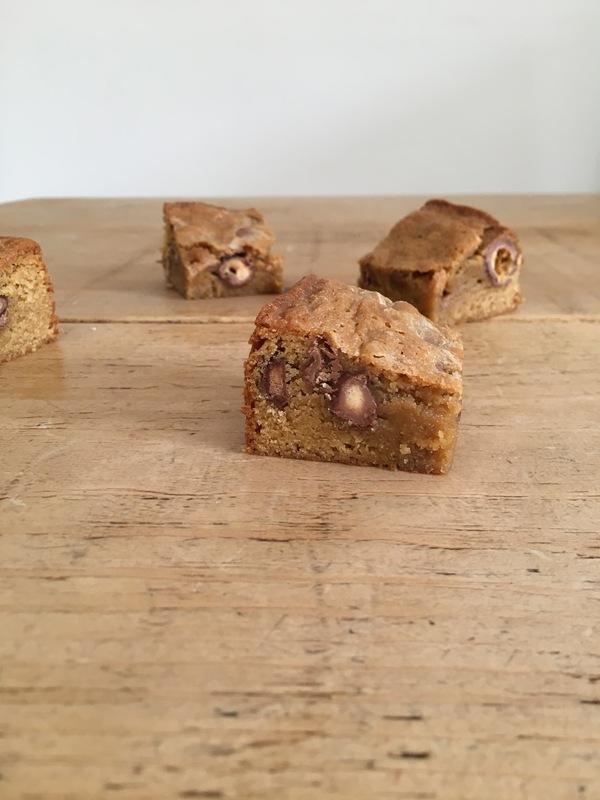 This recipe won’t win any rewards for refinement, but it’s a classic home baked bar I’ll be making time and again. With a tin of these in the kitchen, who needs an evening out? 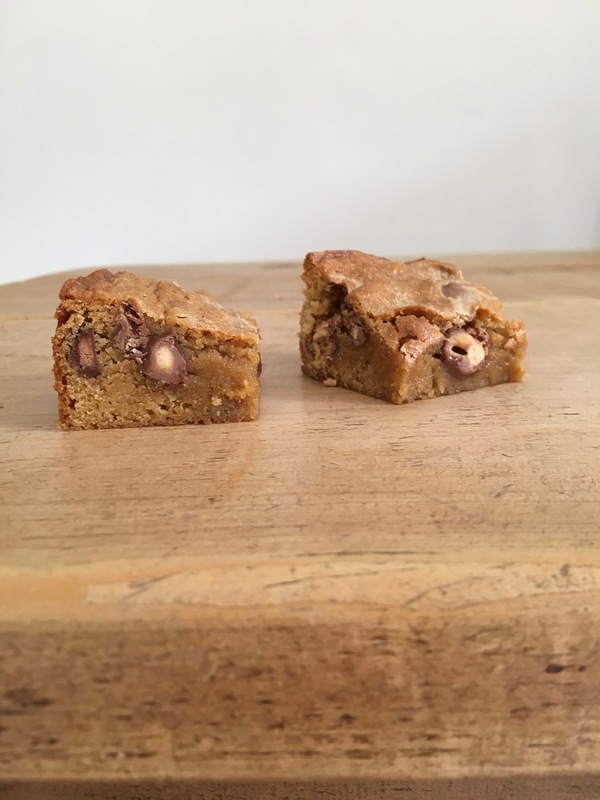 Gooily chewy blondies with notes of malted milk and pockets of crisp Maltesers. Perfect for an afternoon treat or dressed up with a scoop of cold ice cream for a decadent dessert. Preheat the oven to 180C/160C fan/ gas 4. Grease a 20 x 20cm brownie tin with butter and line the base with parchment paper. Beat together the melted butter and sugar, until smooth, then beat in the eggs. Add the malted milk powder, flour and baking powder, stirring to just combine, then fold in the Maltesers. Spoon the mixture into the prepared tin and bake for 25 - 30 minutes, until cooked around the outside but still slightly wobbly in the middle. 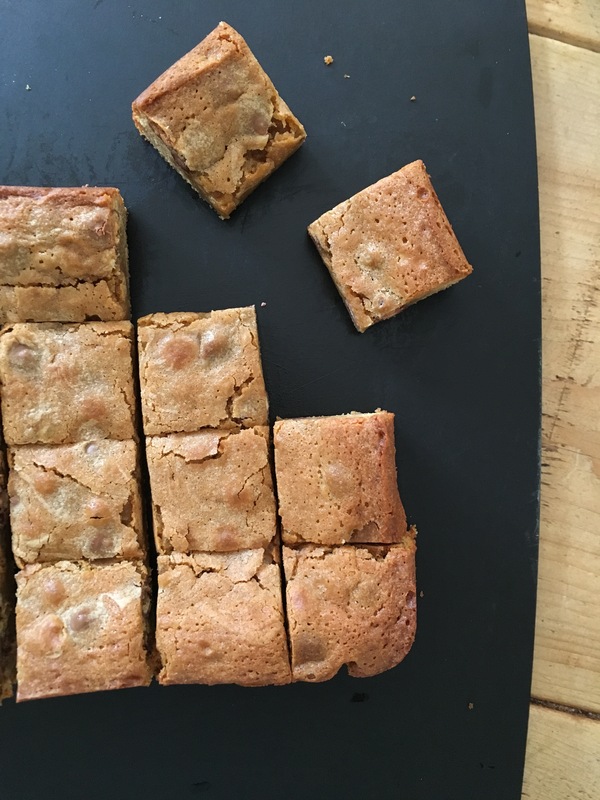 Allow to cool completely in the tin, then cut into squares. Sounds delicious and not too long to make! I will always say yes to white chocolate ! Anything malted milk does it for me. These look delicious. I love how squidgy the center of those look! 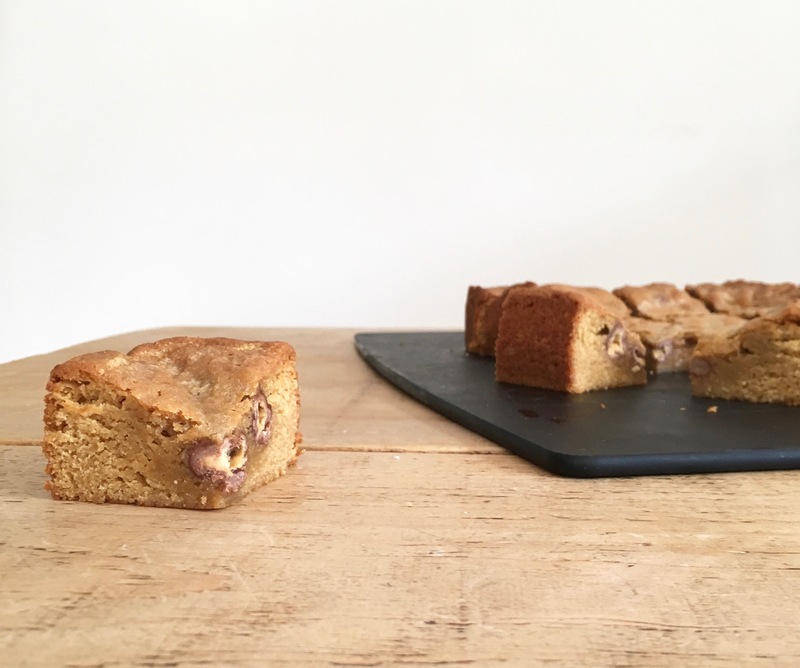 Putting Maltesers in blondies sounds like heaven to me. And I’m a total homebody, too — good for you for getting your much-deserved night out!! 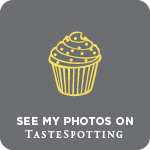 These look utterly delicious, Kate!! !